I've had a few emails recently asking about aquaponics so I thought I might do an aquaponics post, even though we sold our system three years ago. 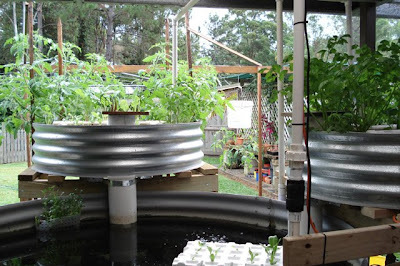 Aquaponics is an organic way of growing vegetables and fish in the backyard. It's like hydroponics, with fish attached, and unlike hydroponics, it's organic. I think it will be much more popular in the future as people start producing more food in their backyards and try to maximise the space they have available. 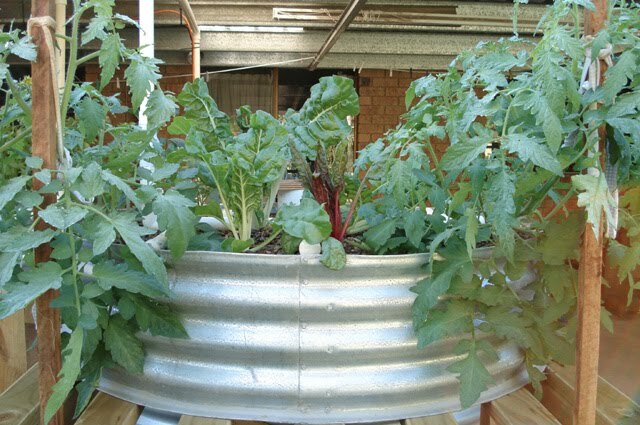 An aquaponics system such as the one we had, take up a small amount of space, we had ours on the back verandah, and even if you have no garden to plant up, you'd be able to produce a good amount of vegetables in a small space with no soil. It seems to me to be ideal for those people who want small livestock, like rabbits, chickens and pigeons. 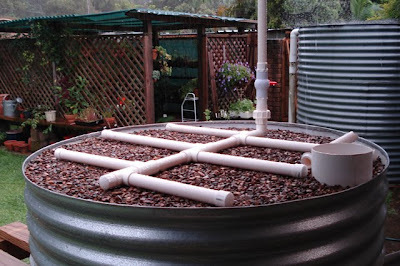 Basically, an aquaponics system is made up of growing beds containing gravel and water, where you plant your vegetables. 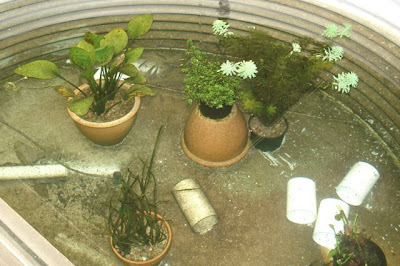 Those grow beds are attached by a series of pipes to a larger fish tank. 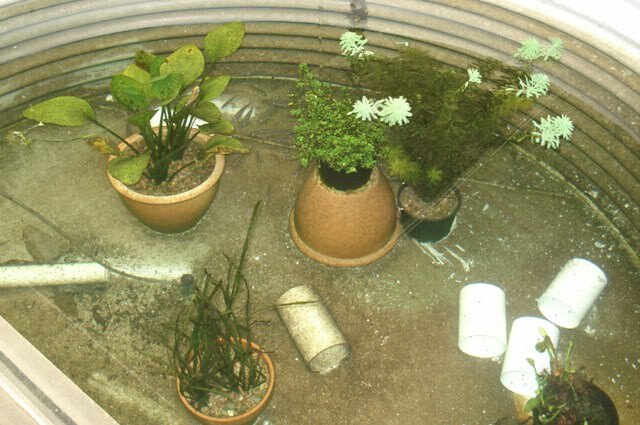 The water from the fish tank is pumped up to the grow beds, the vegetables take up the fish waste and are fertilised by it, then the cleaned water falls back into the fish tank. That is a very simplistic explanation, there is beneficial bacteria involved too, much like a living culture in yoghurt, that helps with the purification of the water. So even though the system does use a lot of water - our fish tank held 3000 litres/quarts, the water is recycled constantly and apart from the occasional topping up due to evaporation, it conserves water rather than wasting it. Over the course of a year, you'd use less water on an aquaponics system than on a regular garden. We had our system custom made by a local firm but you could just as easily make up a system using recycled barrels and containers. 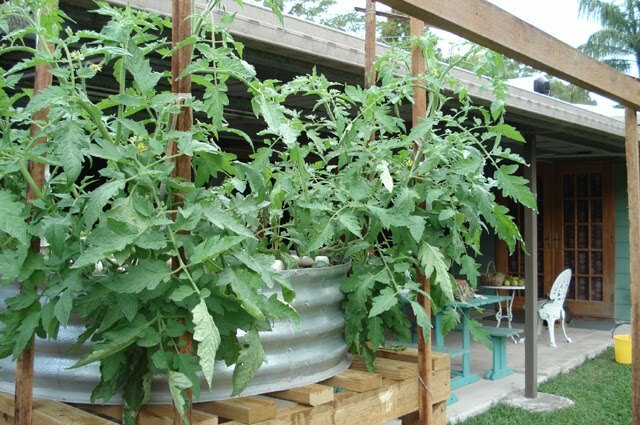 I've seen many systems made up of old bath tubs, rain barrels and large plastic containers. The cost of the electricity to run the pump was minimal. 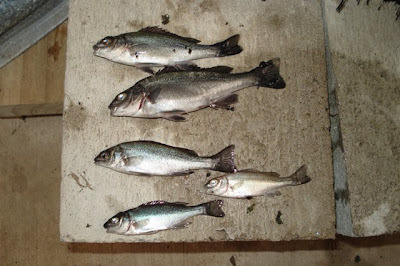 You need to feed the fish and there is organic fish food you can buy, which differs according to the type of fish you grow, but you can also feed them table scraps. I imagine someone has worked out by now a good way of feeding the fish without buying food all the time. That was something we were working on when we sold our system. We liked keeping the fish, they were wonderful to watch and the sound of the water falling was delightful, but our fish died, and when it happened a second time, we gave up. We didn't know enough about it to stop what was happening. Now we know that we should have shaded our water to stop extra algae building up, which robbed the water of oxygen, which killed the fish. We kept silver perch, a native Australian fish, but you can keep barramundi and redclaw, and other types of perch. I believe the popular fish in America is Tilapia. If you love to eat fish this is a great way of having fresh fish on hand when ocean stocks seem to be in trouble. This is definitely sustainable fish at its best. 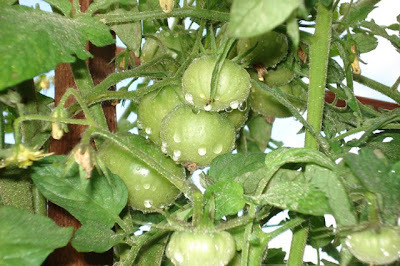 Aquaponics is suitable to most climates, if you're in a cold climate, you can keep the system indoors. 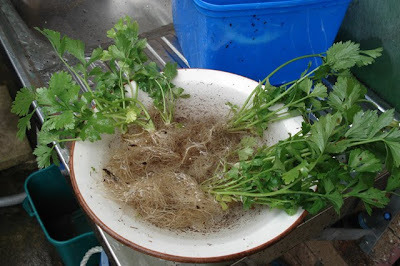 You use your usual seeds or seedlings, you just need to wash the soil from the roots of anything you plant. The gravel in the grow beds takes the place of soil and the roots snake their way through the gravel to make them stable. We got a few good crops from our system but never ate any fish. It takes about 18 months for fingerlings to reach plate size. Any green leaf crop, as well as tomatoes, capsicum/peppers, celery, beans, cucumbers etc are ideal for an aquaponics system. 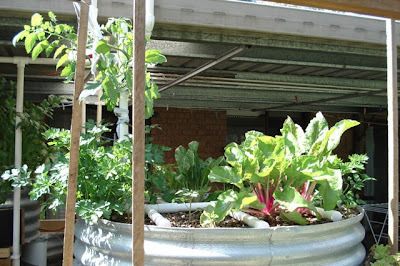 Had we not had a thriving soil vegetable garden and had we been younger, we would have persisted with the aquaponics. But when we had our second fish catastrophe, we decided to sell up. 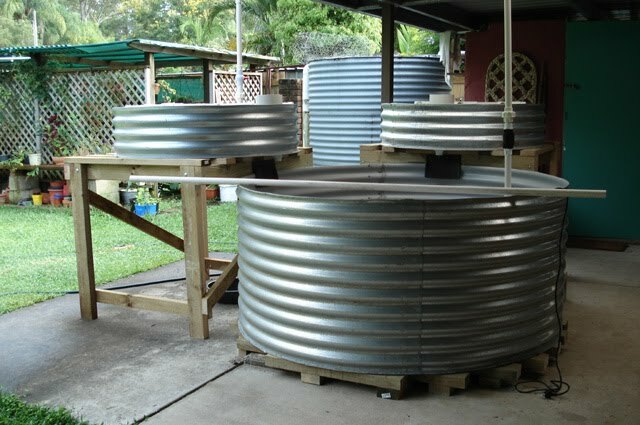 There is a very good aquaponics forum here. If you're interested in aquaponics, it would be a good idea to join a forum and learn all you can before you buy. Any good system will give you vegetables and protein, and therefore move you further towards food sustainability. Like anything, there is a lot to learn, but the rewards are there if you put in the work. ADDITION: I just received an email from Caroline who came to my Frugal Home workshop yesterday. She does volunteer work at the Yandina Community Gardens and said there are three working aquaponics systems up and running at Yandina that you can inspect on Tuesday and Saturday mornings. If you live close by, it would be worth a visit. Sounds delightful! I used to have a large goldifsh and koi pond in which I grew a lot of things. 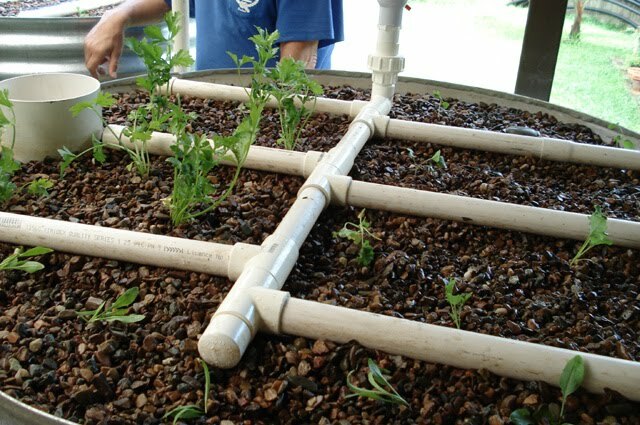 I was amazed at what would grow in a water system like that. You almost tempt me to take it up again, almost. Have you seen http://gardenpool.org/ ? Thanks for sharing about your system, it was really neat! My husband and I are preparing to move to a poor area of the Philippine Islands. We are going to help with teaching the people there about sustainable living. The program teaches people to raise goats for milk and then teaches them how to grow organic gardens using the goat fertilizer. 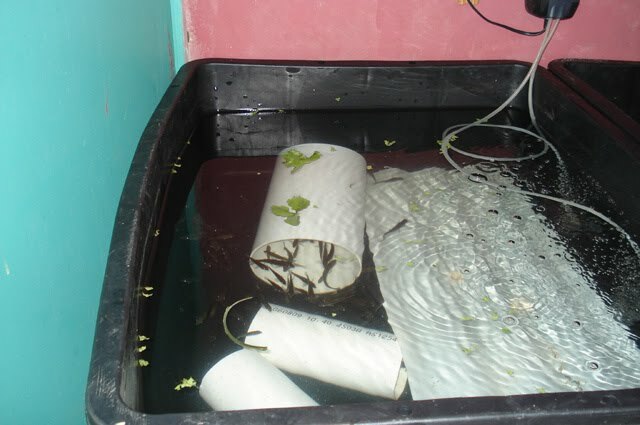 In turn, they can also grow vermiculture (earthworms) using goat fertilizer and tablescraps. The worms can be sold for income or can be used in their organic gardens. It is a great program that is helping an entire community to get out of poverty and to live productive, respectable lives. 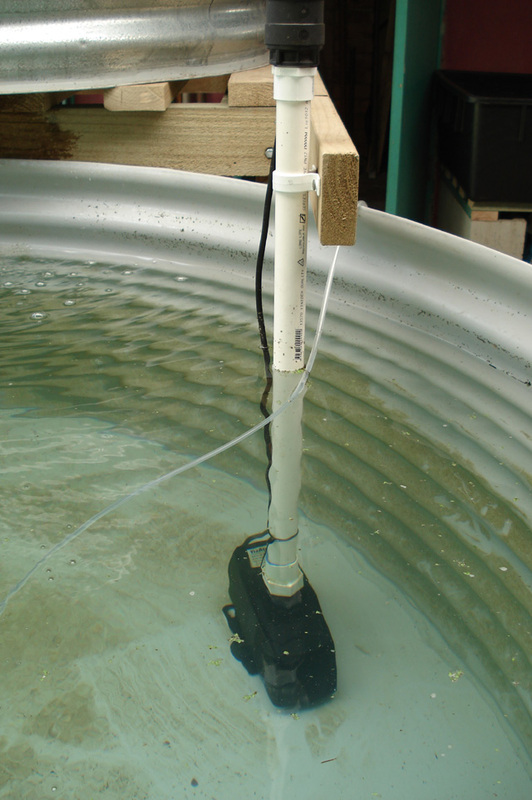 Aquaponics may be the next step. 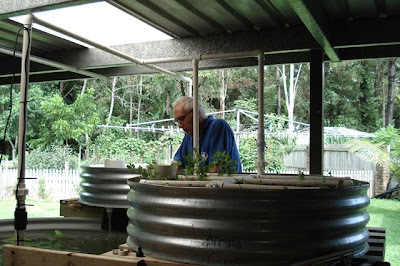 Thank you so much for sharing your knowledge, even though aquaponics was not the best fit for your life situation. It's a great system that will bless many people. Thanks so much for sharing this with us. We have been thinking about a pond to grow fish for food. This would be much more feasible.Looking in to it for the next year. I really appreciate your site and focus. We are a family of eight in Florida, USA and just recently purchased 20 acres to build our own homestead. The Lord provided it debt free! Our goal is to be self-sustaining and to help others learn the same. 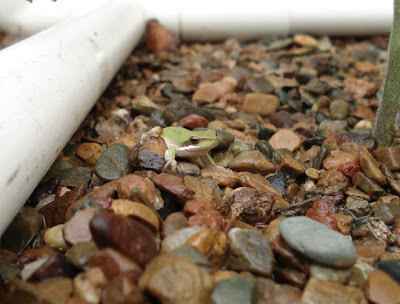 We've had a hobby farm for years, but now want to start learning about aquaponics, so I was glad to read your posts and get some helpful links. Your "home" focus is inspiring!